We hope you will join us at the lovely Chocolaterian Cafe for this intimate concert featuring cellist Steuart Pincombe, joined by violinist Kangwon Kim and singer Michelle Pincombe. The program at the Chocolaterian is titled “Sweet Sorrow” and features music of some of the Baroque period’s most beloved composers: Abel, Biber and Bach plus an original composition by Steuart. Joined by pianist Matthew Mazzoni, this concert explores music of Johannes Brahms and the poetry of Henry Wadsworth Longfellow in the intimate setting of The Chapel in central St. Louis. Royal Docks Brewing in Canton opens its doors for a special evening of old harmonies paired with new brews. Just as many brewers follow a recipe that was used hundreds of years ago, Steuart's approach to playing Bach also looks back on old “recipes” and methods of playing. The program of Bach’s Cello Suites will be interlaced with short explanations of Steuart’s historical, interpretive approach along with comments from the brewery on the historical brewing method of each beer. Each of the three suites will be paired with one of Royal Dock's own brews. The Bach & Beer program was named one of the “Top Ten classical music events of 2014” by the Cleveland Plain Dealer. 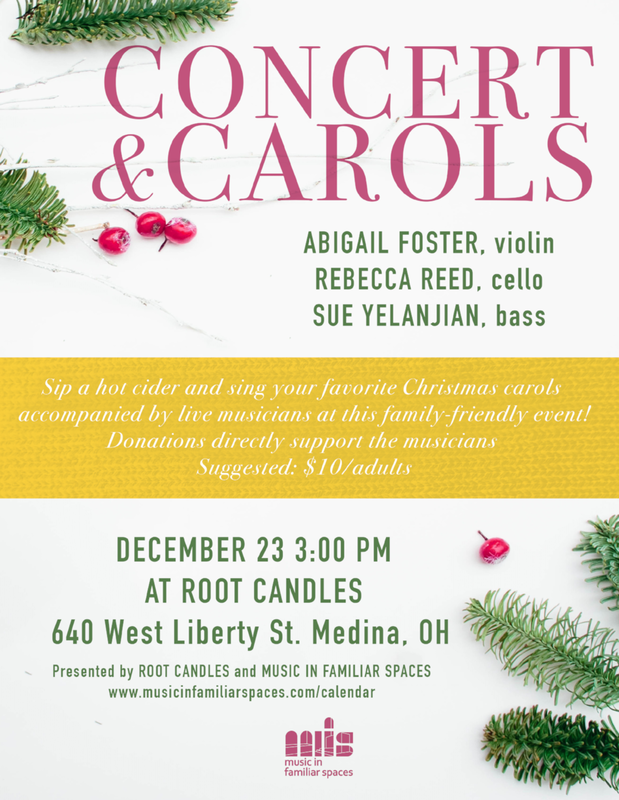 Join us December 23 at 3:00pm at the Root Candle Factory in Medina, Ohio for a special holiday concert, featuring MFS Artist Rebecca Reed (cello) joined by Abigail Foster (violin and Sue Yelanjian (bass). The audience will be invited to enjoy hot cider and to sing along to favrotie Christmas carols in this family-friendly event. Fiðluleikarinn Elfa Rún Kristinsdóttir og sellóleikarinn Vladimir Waltham munu leika fyrir gesti Hannesarholts fimmtudagskvöldið 21.12. milli kl. 19:30 og 20:30. Tónleikarnir verða með óhefðbundnu sniði, en leikið verður í miðjum veitingastofum, í bókastofu og víðar í húsinu. Ekki er aðgangseyrir á tónleikana, en í afgreiðslu verður kassi og posi fyrir frjáls framlög áheyrenda. N.B. This performance will be held in Zaal III, a private chamber concert hall located on Amsterdam's Noordermarkt. There is limited availability so please email Greg Charette if you are interested in reserving a spot! most popular and influential genres – minimalism. intricate patterns and details intertwining, so it is with minimalist music. MINIMALIST JUKEBOX centers around Philip Glass’s Etudes for piano. varicolored takes on the minimalist aesthetic. Gregory Charette (b. 1987 in Los Angeles) is a conductor, composer, pianist, and programmer deeply committed to the performance and promotion of new music. He is currently music director of Oerknal, a contemporary music collective dedicated to reimagining and reinvigorating the concert experience. He studied with Pierre Boulez at the 2011 Luzern Festival and has served as conductor in the Holland Festival’s John Cage Centennial as well as the Aldeburgh Festival’s Emerging Composers Program, where he has worked closely with Oliver Knussen and Colin Matthews. He made his debut with the ASKO|Schönberg Ensemble in the opening concert of the 2012 Gaudeamus Festival, stepping in at short notice for Etienne Siebens. Gregory earned his B.M. in composition from the Oberlin Conservatory of Music, where he studied with Lewis Nielson and participated in master-classes with Helmut Lachenmann, David Lang, and Rebecca Saunders. He moved to The Netherlands to study orchestral conducting at the Royal Conservatory of The Hague and earned his M.M. from the Dutch National Masters in Orchestral Conducting, a program that allowed him the opportunity to work with various professional Dutch orchestras in master-classes, rehearsals, and performances. His primary teachers were Jac van Steen and Kenneth Montgomery. Engagements have included concerts with ASKO|Schönberg Ensemble, Nieuw Ensemble, Ensemble Contrechamps, Britten-Pears Ensemble, Kosovo Philharmony, Nederlands Philharmonisch Orkest, Residentie Orkest, Noord Nederlands Orkest, and Philharmonie Zuidnederland. Gregory currently resides in The Hague and is a guest professor at the Conservatorium van Amsterdam. Next Door Brewing in Madison opens its doors for a special evening of old harmonies paired with new brews. Just as many brewers follow a recipe that was used hundreds of years ago, Steuart's approach to playing Bach also looks back on old “recipes” and methods of playing. The program of Bach’s Cello Suites will be interlaced with short explanations of Steuart’s historical, interpretive approach along with comments from the brewery on the historical brewing method of each beer. Each of the three suites will be paired with one of Next Door's own brews. The Bach & Beer program was named one of the “Top Ten classical music events of 2014” by the Cleveland Plain Dealer. Open Classical is proud to present one of the most accomplished musicians on his instrument in the world. You have to hear him to believe it! 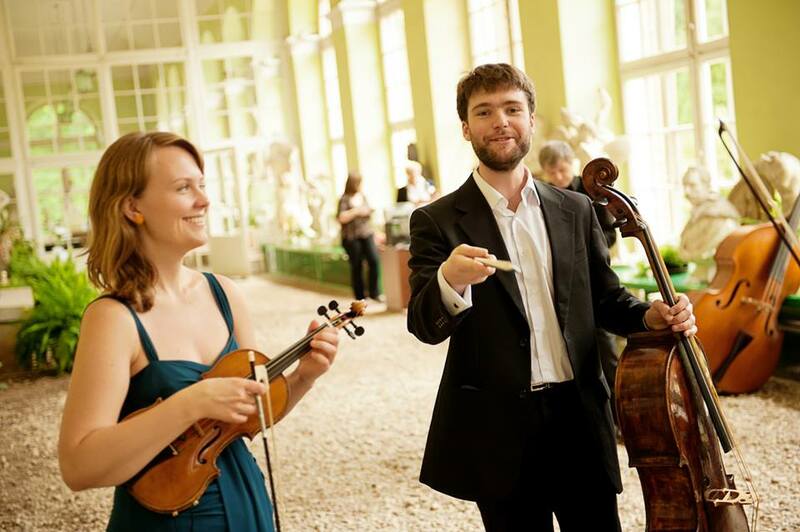 Szymon Marciniak is recognized as one of major masters on his instrument. Through his original musical approach and lively interpretations of classical bass-repertoire as well as transcriptions, he constantly receives acclaim and enthusiastic reactions from listeners and critics alike. 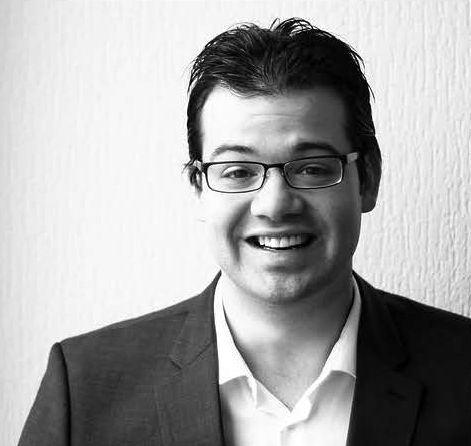 He has performed as recitalist and soloist in most European countries as well as Canada and United States. His debut double CD with solo sonatas and miniatures by Adolf Mišek (1875-1955), released in 2012 has been warmly received by international press, getting reviews by such renowned magazines as Fanfare or The Strad. Norwich, UK - Matthew Wadsworth presents "Lute at the Octagon"
Tickets: at the door, name-your-own-ticket price (suggested: £15-25). An intimate solo lute concert with music by Dowland, Johnson, Goss, and Kapsberger. Kompaan in The Hague opens its doors for a special evening of old harmonies paired with new brews. Just as many brewers follow a recipe that was used hundreds of years ago, Steuart's approach to playing Bach also looks back on old “recipes” and methods of playing. The program of Bach’s Cello Suites will be interlaced with short explanations of Steuart’s historical, interpretive approach along with comments from the brewery on the historical brewing method of each beer. Each of the three suites will be paired with one of Kompaan's own brews. The Bach & Beer program was named one of the “Top Ten classical music events of 2014” by the Cleveland Plain Dealer. Foolproof Brewing in Pawtucket opens its doors for a special evening of old harmonies paired with new brews. Just as many brewers follow a recipe that was used hundreds of years ago, Steuart's approach to playing Bach also looks back on old “recipes” and methods of playing. The program of Bach’s Cello Suites will be interlaced with short explanations of Steuart’s historical, interpretive approach along with comments from the brewery on the historical brewing method of each beer. Each of the three suites will be paired with one of Foolproof's own brews. The Bach & Beer program was named one of the “Top Ten classical music events of 2014” by the Cleveland Plain Dealer. Wormtown Brewery in Worcester opens its doors for a special evening of old harmonies paired with new brews. Just as many brewers follow a recipe that was used hundreds of years ago, Steuart's approach to playing Bach also looks back on old “recipes” and methods of playing. The program of Bach’s Cello Suites will be interlaced with short explanations of Steuart’s historical, interpretive approach along with comments from the brewery on the historical brewing method of each beer. Each of the three suites will be paired with one of Wormtown's own brews. The Bach & Beer program was named one of the “Top Ten classical music events of 2014” by the Cleveland Plain Dealer. We are so pleased to have the opportunity for one last house concert on our yearlong tour, hosted by the Laird Family! Steuart will play his program "The Bach Reader", and audience members will be invited to enjoy some food and drink following the concert. We hope to see you in Colorado Springs! We are so pleased to be partnering with Blue Sky Concert Parties on our stop in Santa Fe, New Mexico for a special house concert. Steuart will play his program "The Bach Reader", and audience members will be invited to enjoy some food and drink following the concert. Space is limited. If you are interested in attending, please email Margaret Cushing at: blueskyconcerts@gmail.com. Pay what you wish, with a $20 suggested donation. We hope to see you in Santa Fe! Bow & Arrow Brewing in Albuquerque opens its doors for a special evening of old harmonies paired with new brews. Just as many brewers follow a recipe that was used hundreds of years ago, Steuart's approach to playing Bach also looks back on old “recipes” and methods of playing. The program of Bach’s Cello Suites will be interlaced with short explanations of Steuart’s historical, interpretive approach along with comments from the brewery on the historical brewing method of each beer. Each of the three suites will be paired with one of Bow & Arrow's own brews. The Bach & Beer program was named one of the “Top Ten classical music events of 2014” by the Cleveland Plain Dealer. Bringing classical music to the Refuge Cafe! Join us for a relaxed and fun program featuring virtuosic pieces from the earliest to latest music for solo cello without the endpin (1689-1875). Three different bow styles (baroque, transitional, and “modern”) are used to perform works by Gabrielli, Bach, Duport, and Piatti. We are pleased to present this newly-designed program, The Bach Reader. The concert will bring the audience into the world of J.S. Bach not only through his music, but in reading letters and stories of the composer. Featuring selections from three of Bach’s well-known cello suites, Steuart will present the readings interlaced with his playing, giving listeners a sense of Bach as a person. We love house concerts! This concert, taking place at the home of the Sanders Family, is sponsored by Credo Music. We'll be talking a bit about the Credo's mission and goals for the LA-area at the concert. If you'd like to come, shoot us an email for the details. Tickets: tickets must be purchased in advance from the kukkula Winery website: www.kukkulawine.com. $25 for the wine tasting (required), plus name-your-own-ticket-price for the concert, to be paid at the door (suggested: $25). We are pleased to present the first Music in Familiar Spaces concert in collaboration with a winery. What better place to do it than the Paso Robles Wine Country? “Bach & Blends” will feature three Bach Cello Suites paired with three of kukkula’s wines, each selected to compliment the unique character of each cello suite. The music will be interlaced with short explanations of Steuart’s historical, interpretive approach along with comments from the winery on the growing, aging and blending process for each of the wine selections. Be sure to purchase your tickets early, as seating is limited. Harmonic Brewing in San Francisco opens its doors for a special evening of old harmonies paired with new brews. Just as many brewers follow a recipe that was used hundreds of years ago, Steuart's approach to playing Bach also looks back on old “recipes” and methods of playing. 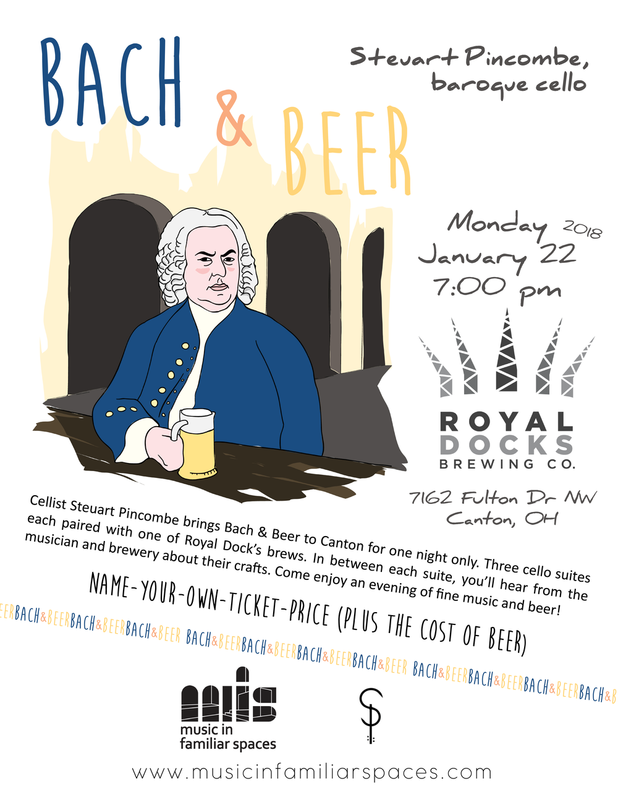 The program of Bach’s Cello Suites will be interlaced with short explanations of Steuart’s historical, interpretive approach along with comments from the brewery on the historical brewing method of each beer. Each of the three suites will be paired with one of Harmonic’s own brews. The Bach & Beer program was named one of the “Top Ten classical music events of 2014” by the Cleveland Plain Dealer. We love house concerts! We're still figuring out the program for this one, but it's sure to be a relaxed, intimate and fun evening! If you'd like to come, shoot us an email for the details. While sipping on their favorite brews at Baerlic Brewing audience members will discover the connections between the art of brewing and the art of playing the music of Bach. Just as many brewers follow a recipe that was used hundreds of years ago, Steuart's approach to playing Bach also looks back on old “recipes” and methods of playing. The program of Bach’s Cello Suites will be interlaced with short explanations of Steuart’s historical, interpretive approach along with comments on the historical brewing method of each beer. Each Suite will be paired with one of Baerlic’s own brews. The Bach & Beer program was named one of the “Top Ten classical music events of 2014” by the Cleveland Plain Dealer. While sipping on their favorite brews at the Machine House Brewery audience members will discover the connections between the art of brewing and the art of playing the music of Bach. Just as many brewers follow a recipe that was used hundreds of years ago, Steuart's approach to playing Bach also looks back on old “recipes” and methods of playing. The program of Bach’s Cello Suites will be interlaced with short explanations of Steuart’s historical, interpretive approach along with comments on the historical brewing method of each beer. Each Suite will be paired with one of Machine House’s own brews. The Bach & Beer program was named one of the “Top Ten classical music events of 2014” by the Cleveland Plain Dealer. While sipping on their favorite brews at the Lander Bar audience members will discover the connections between the art of brewing and the art of playing the music of Bach. Just as many brewers follow a recipe that was used hundreds of years ago, Steuart's approach to playing Bach also looks back on old “recipes” and methods of playing. The program of Bach’s Cello Suites will be interlaced with short explanations of Steuart’s historical, interpretive approach along with comments on the historical brewing method of each beer. Each Suite will be paired with one of Lander Brewery’s own brews. The Bach & Beer program was named one of the “Top Ten classical music events of 2014” by the Cleveland Plain Dealer. We are pleased to present this newly-designed program, The Bach Reader. The concert will bring the audience into the world of J.S. Bach not only through his music, but in reading letters and stories of the composer. Featuring selections from three of Bach’s well-known cello suites, Steuart will present the readings interlaced with his playing, giving listeners a sense of Bach as a person. This free concert is generously sponsored by Credo Music. Parents and alumni of Credo are invited to a special "Credo at the Cafe" in conjunction with the concert - please write to us for more information.